Welcome to the ELPH Band Giveaway Event! Mom Powered Media, ELPH Band, and fantastic group of amazing bloggers have come together to bring you this event, just in time for Halloween. 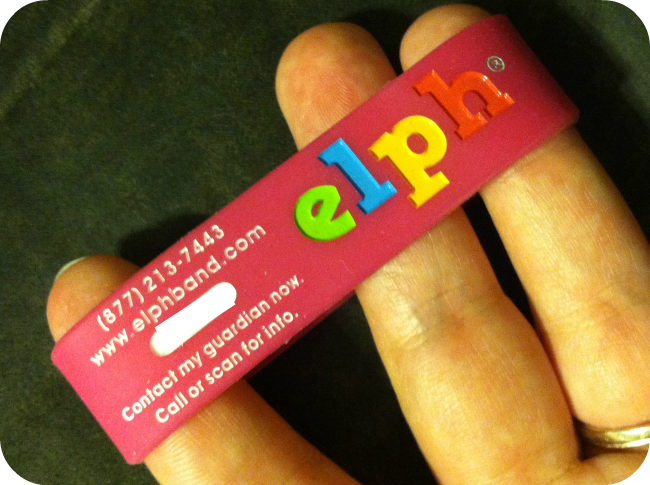 The ELPH band is a non-toxic, durable, silicone wristband. It provides an immediate, highly visible form of identification with clear instructions directly on the band. It's easy to use with options to dial in or scan the QR code. 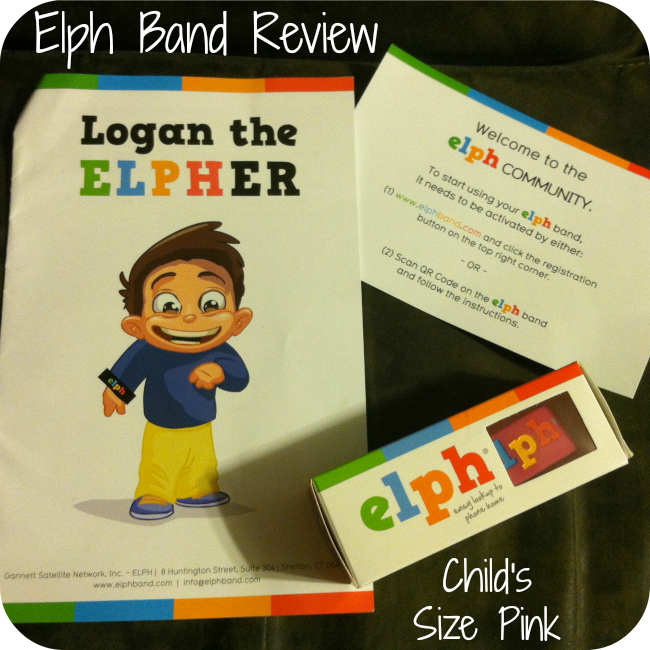 ELPH Band does not put personal information, such as the child's name or phone number where people can see it when it isn't needed. What does ELPH stand for? Easy Lookup to Phone Home If your child get's separated from you, all your child needs to do is show an adult his/her ELPH band. That adult can then call the 800# or scan the QR code to get in touch with you to reunite your child with you! It's that simple! I have blocked out the QR code for safety reasons. Once the QR code is scanned on a smartphone, a screen similar to the one below will pop up for them to get in touch with you. Your actual information won’t be there, but names will be as well as any allergy information. My daughter is allergic to shell fish so this is a big deal for us. It will also state your child’s name so the person who has your child can communicate with them better until you are found. 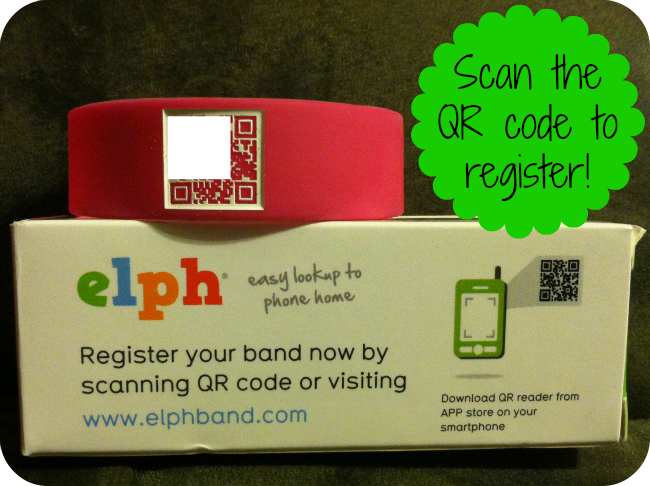 To set up your ELPH band you will register it on a computer, or by scanning the QR code yourself and setting it up via your smartphone. Just a few simple questions and you will be registered. Once completed, you will get a text and email alert letting you know the account profile is active, and to verify the information has been entered correctly. I have blocked out the number for safety reasons. ELPH Bands are available in 3 sizes: Toddler (up to 5.75 inches), Child (up to 6.5 inches), and Adult (up to 7.5 inches). They are also available in two colors, Navy or Pink. Buy it: ELPH Bands are $19.99 each and they come with 1 year of service. You can purchase here. After 1 year of service, you can renew your service with ELPH Band. Disclosure: The participating bloggers were not compensated for this posting. All thoughts and opinions are those of our own and were not influenced in any way. Facebook, Twitter, Pinterest, Google, and any other social media are not affiliated with this posting or giveaway. The participating bloggers are not responsible for prize fulfillment and shipment. Only one entrant per household, per address may enter. Winner is subject to eligibility verification. Winner will be contacted via email and will have 48 hours to respond. Failure to respond in a timely manner, a new winner will be chosen and you will forfeit your prize. This disclosure is done in accordance with the Federal Trade Commission 10 CFR, Part 255 Guides Concerning the use of Endorsements and Testimonials in Advertising. I love that it is an easy set up - having peace of mind on our kids safety is so very important. I love that you can add allergies and any medications taken. That is so VERY important in this day and age. I love that it's easy to use and that you can add info about allergies into it....very helpful. I learned that you need to buy a yearly subscription for the services. Even if there is no internet connection there is an 800# on the band that you can call. When you register the band you can choose to include allergies or medical issues. I learned that ELPH is "Easy Lookup to Phone Home" and it is created by doctor! It has a QR code and is made of silicone should it should be durable. I like that it doesn't share the child's name and that there is both an 800 number and a QR Code to contact to connect parent with child again. It's a nonn-toxic, durable, silicone wristband. Simple registration with a smartphone! I love how the ELPH band can send the parents the gps link so they exactly where they can find their child. I also learned that I doesn't share any of the child's personal information. I love everything about the ELPH band. As a parent my biggest fear is being separated from my child, and this will help give me a piece of mind. I learned that ELPH stands for Easy Lookup to Phone Home and that it comes in sizes ranging from toddler to adult! It can be used for young kids or for adults with disabilities, alzheimer's, etc. I love that it's able to share information to help contact parent/guardian/etc in case the child gets lost but also protects the child's personal information! You can add allergies and medical conditions to the bracelet as well. This seems like a great idea and would give me piece of mind if my child wore one! What a genius idea! I like that it can be used for adults too. It's a reassuring piece that makes parents and loved ones feel a little safer braving the world with a small child. This is a great product! I think it is so smart to have a child's info with them since they might not remember what adults think is important especially in a strange situation. They are made of comfortable material and they are durable. I like that it doesn't have the child's info on the band. I also like that there are 2 ways to obtain the info to contact the parent by scanning or the 800#. I love how you can put allergens and medication on the bracelet. This would definitely come in handy. Being a new mom to a 6 month old my greatest fear as she is starting to walk is somehow me loosing her. I love this product it is durable so its not going to wear off, non-toxic so it won't bother her excima and it has all her infor but not displayed for just anyone to see. Whether I win or not I will get one of these. Her safety is of utmost importance!!! I learned that the information can be updated very easily at any time. This really seems like the perfect choice for parents who are concerned about their childs safety. I would love to use this especially while we travel! Fantastic product :) its great that can put extra info like allergies and medicen info also. I love how easy it is to register the product/update information, and that there are two different ways to contact parents if kids get lost and have this band on. The band is bright, too, which makes it easy to spot and check out. This product seems awesome! It sends alert messages that tell the emergency contacts when the ID was scanned and provides a current GPS location. This is a fantastic product! I love that it's made of silicone and comes in different sizes. It's great that no information is on the band and there are 2 ways to collect info. I learned that all information can be updated at any time, including temporary situations that may need an emergency contact information change. Once information is changed and saved, it will update in real time. I learned about using the QR code for finding out the emergency contact information!